The Melourne, Port Phillp & Yarra maps have since been revised to be effective April 2010. Picked up today at the Met Shop was a new local travel guide for Hume City dated December 2010. This is the first new printed guide I have seen since Wyndham was issued in April last year. It is actually more up to date with its content than the online edition which is still dated April 2010, as are many of the other online guides. A number of them are long overdue for updating. New Wyndham map is now available on the Metlink website. Online versions of almost all maps have now been updated - about time!!! Updated maps for Greater Dandenong, Hobsons Bay, Kingston, Melton, Mornington Peninsula & Whittlesea are still not available. The April 2010 map for Frankston remains current. This is the first edition of the Mornington Peninusla map to be issued in the current mapping style, and I must say it was well worth the wait! The remaining maps are now online, all dated May 2011. Although the Whittlesea map is dated May 2011, the vesion that has been uploaded doesn't incorporate the changes to 525/561. Craig wrote: Although the Whittlesea map is dated May 2011, the vesion that has been uploaded doesn't incorporate the changes to 525/561. Those routes don't run in the Whittlesea shire?? No, but these maps show parts of neighbouring municipalities. In this case, all areas covered by the extended 561 are shown on the map, hence the online map should reflect this change. The Whittlesea Local Area map has now been updated again to show the 561 extenstion. For the first time in sometime up-to-date maps are available online for all metropolitan municipalities. I have also seen an updated map for Bayside at a route 626 bus stop but it isn't on the website yet. The maps for Bayside, Glen Eira, Melbourne & Port Phillip show the planned extension of Route 606 (Port Melbourne - St Kilda) to Elsternwick. No date has been announced for this but the current Metlink timetable is shown as finishing on 11 December. The maps for Brimbank & Melton show a change of route for the 461 (Watergardens - Taylors Hill) & extension to Caroline Springs & the introduction of a new route 462 in the area. Again although there is no date for this Metlink shows the present 461 timetable as finishing on 27 November. If there are any changes in Hobsons Bay & Wyndham I couldn't spot them. The changes in Hobsons Bay & Wyndham are to do with the 415/6 with the 416 now travelling via central rd to replace part of the 415 loop which will no longer exist. werd wrote: The changes in Hobsons Bay & Wyndham are to do with the 415/6 with the 416 now travelling via central rd to replace part of the 415 loop which will no longer exist. Thanks for that. I have just compared the old & new maps & see what you mean. i guess that there will be new timetables for the 415 & 416 at the same time as the 411/412 & 414. The new route 462 and extension to 606 were both promised to be implemented when respecive bus review reports were released - these upgrades are long overdue. The only remaining commitment to be fulfilled (as opposed to a mere recommendation) is an upgrade of 479 services to Melbourne Airport. Mike M wrote: The maps for Bayside, Glen Eira, Melbourne & Port Phillip show the planned extension of Route 606 (Port Melbourne - St Kilda) to Elsternwick. No date has been announced for this but the current Metlink timetable is shown as finishing on 11 December. I note that only the Fishermans Bend - Bay Street Port Melbourne section of the route has "Mon - Fri" labels (mostly through industrial land), and there is a curious little deviation near Bay Street as well - looks like they might be upgrading the majority of the route to 7 days operation?! If so, would be quite an upgrade from the existing peak only span, and provide a weekend tourist link between Port Melbourne & St Kilda. 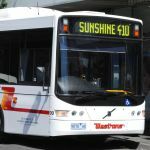 Pity it wasn't simply done as an extended 630 service to Port Melbourne, as BusVic is advocating for. If my memory serves me correctly there was also a suggestion that the 630 could be extended from Elwood Beach to Elsternwick Stn via New St. Either proposal would have been better than the present arrangement with a terminal in the middle of nowhere at the side of Elsternwick Park. Craig wrote: I note that only the Fishermans Bend - Bay Street Port Melbourne section of the route has "Mon - Fri" labels (mostly through industrial land), and there is a curious little deviation near Bay Street as well - looks like they might be upgrading the majority of the route to 7 days operation?! If so, would be quite an upgrade from the existing peak only span, and provide a weekend tourist link between Port Melbourne & St Kilda. According to the Metlink website: "Weekend trips terminate at Bay St (Port Melbourne)". So that'd appear to be correct. November 2011 maps have now appeared online for both Brimbank & Melton. The temporary route for new 462 direcly via Taylors Rd is no longer shown, as this wasn't necessary. Craig wrote: November 2011 maps have now appeared online for both Brimbank & Melton. Everytime I look at the Melton map makes me realise how obvious it is that there should be a service from Melton to Watergardens straight down the Melton Highway. Mike M wrote: Everytime I look at the Melton map makes me realise how obvious it is that there should be a service from Melton to Watergardens straight down the Melton Highway. Looks obvious but there is sweet bugger all between Hillside and Melton to justify the run. If he was President now - but he's not. You could make the same argument for the existing 456 between Melton & Caroline Springs. There might be a lot of open country along the Melton Highway but surely the whole point of it would be to provide a direct link from Melton & its suburbs to a major regional shopping centre? The online edition of the Maroondah map continues to be incorrectly cropped, with Knox City only partly showing on the map - the maps at the stops show Knox City correctly though. The maps for Greater Dandenong & Kingston are yet to be updated (removal of AM Peak 691 extenstion between Waverley Gardens & Monash Uni).